The restaurant complex is located strategically at Velan Corner, at the junction of Rajaji Salai and Sarojini Salai in Ramnagar, Coimbatore. Rajaji Salai is a right turn off Sengupta Street when proceeding towards Patel Road from Dr. Nanjappa Road. We have over 20 years of fine foods tradition developed carefully and with loving attention to details. We listen to our guests to refine our offerings and menus constantly. Born from and firmly rooted in the local culture and customs, the Velan tradition draws on the local values of entrepreneurship and gracious hospitality. At Velan you will find these values in our menus, our service, and our total presentation. 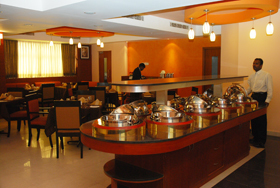 The Velan Food Park offers three levels of meeting space. Rich Dine on the first floor can seat up to 50 guests; our second floor meeting space Flavors can accommodate 40 guests and the roof top Barbeque can seat 40 guests. Contact us for your next birthday, anniversary ,engagement ceremony, office get together or office meetings. Our level of service and quality of food will keep you satisfied.